Screenshots in this post are from my colleague Kirk Hamilton’s experience sticking up the doctor’s drug store. His experience is similar to mine, with the main difference being that he thought to capture video and screenshots of it. Kotaku Game DiaryDaily thoughts from a Kotaku staffer about a game we’re playing. Red Dead Redemption 2 doesn’t force many of its myriad activities on players, though it it’ll often send characters your way to tempt you to try certain things. Those of us who’ve played the game haven’t all seen the same sights, but a good chunk of us have at least have robbed the doctor’s drug store in the game’s starter town of Valentine. It’s a robbery that seems divisive. I held the good doctor up when I was playing the game about a week or so ago. I was excited about committing the virtual crime but ended up perplexed about how it played out. Soon, I was Googling to find out how the stick-up went for other players. I read reactions on message boards, tips articles and Reddit threads. Some players were befuddled about what exactly our options were. Some were psyched that it’s a method toward getting a great weapon. Some were annoyed, as I was, about a locked door and the apparent inevitably that this robbery will always go badly. 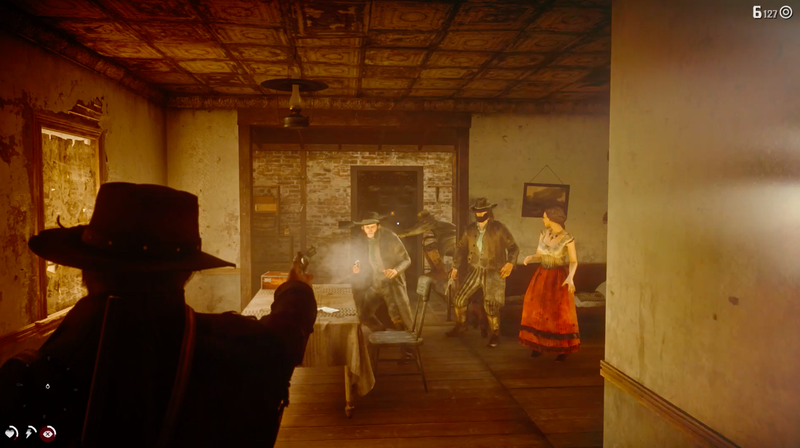 The drug store robbery signals early on that Red Dead 2’s shops aren’t just the glorified single-purpose menus that most stores in video games are. Some establishments, the game teaches players, have something shady going on in their back rooms, though you’ll only be able to access that if you snoop around the exterior of the shops or get a tip from a local. I found out about the doctor’s office that second way, after helping a man on the outskirts of Valentine with a problem that now escapes me thanks to the fog of the late-night gaming session when I encountered him. If you get the intel that there’s illicit activity going on in the back room of the doctor’s drug store, then you’ll be given the option to rob the place the next time you visit him. I did just that and went and pointed a pistol at him. The doctor quickly confessed and walked my character, Arthur Morgan, toward a metal door in the rear of the shop. The doctor had words with the guys in the back and lied to them to get them to open the door. They were back there counting money or something. Controlling Morgan, I pointed my gun at some suddenly concerned ne’er-do-wells who then decided to respond with gunshots. The gun battle seems to be automatic, and it swiftly triggers the law’s interest. The sheriff’s office and jail is next door, after all. You only have seconds to search the dead bodies of the crooks you’ve killed and to open a box in that back room that contains the unusually good Schofield revolver. There’s a safe in the back room, but the game doesn’t tell you how to open it and many early-game players like me haven’t picked up any tools needed to crack it by the time they do this robbery. There’s also a door in the back that sure looks like it locks from the inside. Since you’re inside when doing the robbery, I figured the player can open it. Nope. It’s bolted shut or locked or both. The impassable rear door forces the player to exit the way they entered, except by this point, law enforcement will be funneling in. When I played, I had a lawman running into the back room, shooting at me before I could even get out of there. When my colleague, Kirk Hamilton played, the same thing happened. We both found ourselves in a massive shootout, both had to gun down a handful of lawmen just to get onto our horse and out of Valentine and both went from bounties of zero to $300 in seconds. Another colleague, Heather Alexandra, told me she got out fast enough that she was able to slip out without killing anyone. It seems that many players experience the robbery the way Kirk and I did. They try and fail to slip out the back and can’t do this robbery without attracting a ferociously violent response, both from the crooks in the room and the law who then come to investigate. The game autosaves in a way that also keeps many players from being able to try the robbery a second time, leading players to give advice to others, hoping the next player will figure out a better technique. I’ve seen some players speculate about how to slip past people using different outfits or guns, but I’ve not seen proof that anything reliably works. If there’s a way, I’d love to know. Mildly frustrating as it can be, I’m glad the drug store robbery exists. It demonstrates one of the added possibilities this game presents players and that many other games don’t or can’t. The downside, arguably, is that it feels cheap. That door in the way back begs to be opened, yet it won’t budge. That leaves most players in a huge shootout. Then again, maybe that too is a positive. Maybe it’s teaching players that robberies have consequences. It has spawned some wild theories about how to get through the robbery without racking up a bounty (one player suggested fighting all the back room crooks with throwing knives; another said they were able to keep things relatively quiet by lassoing and hogtying the lawman who runs into the back to find out what the fuss is). The whole sequence works for me as a way for Red Dead Redemption 2 to advertise the unexpected options it’ll give players, the wider range of things the player does. It also shows the extent and limits of how things work in a game that is ultimately going to be pushed and pulled by the limits imposed by the developers and players’ efforts to test them. The drug store robbery is a memorable moment nonetheless and one that many players can assume others have also experienced. How did your robbery of the doctor’s office go? Hopefully at least somewhat differently than mine.